The eye area is one of the first places that your skin will show signs of aging. L’BRI has created an all-natural facial care product designed to restore elasticity to the eye area and diminish the appearance of fine lines, puffiness and dark circles. Smooth n’ Firm Eye Repair Gel uses stabilized aloe vera as the primary ingredient, along with Cucumber, Coneflower extract, White Lily, Elderflower, Meadowsweet, Vitamins A, C, E and more. I have used this product for more than a week now, but I noticed almost immediate improvement when I used L’BRI’s Smooth n’ Firm Eye Repair Gel. The skin around my eyes felt and looked fresh and rejuvenated, and the usual fine lines did become a lot less noticeable within just a few applications. I can honestly say I love using this product because it has made a positive difference in the way my skin looks and feels! If I had to describe Smooth n’ Firm Eye Repair Gel in one word, I would choose “gentle”. It glides on smoothly and feels cool and refreshing. Before I tried this product, I was concerned the aloe vera may cause it to feel sticky (because of my past experiences using aloe vera gel)– but the Smooth n’ Firm Eye Repair Gel doesn’t feel sticky at all. The gel absorbs into the skin very quickly, leaving it soft and younger-looking. L’BRI’s products are never tested on animals and are free of pore-clogging ingredients such as sodium laurel sulfate, propylene glycol, mineral oil, lanolins, waxes, artificial colors and fragrances. All products meet or exceed FDA requirements. How much is it? 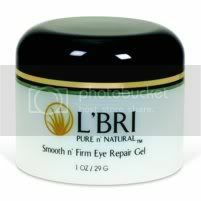 L’BRI’s Smooth n’ Firm Eye Repair Gel is just $28.00 for a four month supply. In my opinion, this is a great price on a quality, all-natural anti-aging product. 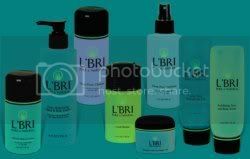 Visit the L’BRI website to learn more about their skin products and to find out how to make a purchase. L’BRI offers free samples of their Customized Skin Care Trio, Eye Repair Gel, Instant Face Lift Facial Masque and Rejuvenating Enzyme Facial Peel. The only cost incurred is $6.95 for shipping. Although I was not asked to review the other products listed in the sampler, I have been using them and want to tell you that I’m impressed with this line of skin care. Every L’BRI product has been gentle on my skin and left it looking radiant. I have been using the sample size products twice a day for a week now and still have several days’ worth of product left. You will definitely have a good idea of how well the skin care line works if you order the sampler, although using the products for 30 days is recommended so that you can realize the full benefits. L’BRI offers a satisfaction guarantee to all customers. CLICK HERE TO ORDER YOUR SAMPLES TODAY! Disclaimer: I received samples of L’BRI products free of charge for review purposes. All opinions expressed in this review are honest and my own, based on my personal experiences with the product. Previous Post: « Congratulations To 3 Giveaway Winners! Thanks for the great press regarding L’Bri skin care products. I just became a consultant in April, but have been using the products for 7 years. I have struggled with very oily blemished skin all my life. I’ve tried every product on the market and seen a couple of dermotologists. I was even a guinea pig for Acutane in my high school years. My experience with L’Bri has been life changing. The products have dramatically reduced my pore size and softened the appearance of scars from acne. I love the eye repair gel! It works great for the puffiness and dark rings under the eyes. My husband uses it too! Thank you once again, but most of all thank you L’Bri for creating such a wonderful product! I am proud to be part of the team! Thank you for sharing your personal experience with L’Bri products. I think the eye repair gel is wonderful too! I can really tell the difference when I use it. Best wishes to you as you grow your business as a L’Bri consultant. I appreciate your comments here and I know other readers will benefit from them, too.